I'll tell you a secret.... I have a hang-up about poetry. I sit here with my mind somewhere else... I'm thinking, can I be certain the lawn doesn't shrill in anguish at the sound of a mower? Okay, seriously I'm really thinking about the existence of words without sound. They don't require sound do they? Of course not... I'm plotting them out here on the computer and there is no sound, save for the clicking of the keys and you can't distinguish the sound I made for and from you. When I was in high school our Latin teacher referred to Latin as a written language as opposed to a spoken language. I'm imagining if today English were strictly a written language how different communication would be. Certainly less spontaneous. Poetry readings would take on a whole new meaning. Imagine a poet walking into a room of eager poetry consumers. Theater style seating. The poet passes out sheets of paper to the some 25 to 30 people who showed up. Then he stands back and watches the non-verbal reactions to what is read, and imagines what parts the people are reacting to and just what those reactions mean. I don't suppose any of you are buying this scene. You probably are even questioning that we got more than two dozen people to any kind of poetry reading. Why am I even talking about this idea? Well, as much as I do enjoy doing readings (where I read aloud my own poetry) I am convinced that spoken word poetry still lacks something critical to language. That is to see the poem on a printed page. To see the words - the spaces between. The black and the white. The image and the lack of image and the whole visual that creates both. I guess simply put, I want all poetry to be viewed as concrete poetry. It's just a little hang-up I have. to get to Starbucks with your journal and discover you got off without your favorite fountain pen that you always write with? Shirley Dent expounds upon the place of poetry in China and contemplates a time down the road, when we're not just sitting up and "taking notice of China's economic dynamism but of its poetic and political vibrancy as well." Janyne Pupek has two poems up at The Dirty Napkin. Yeah Jayne! Two Seattlelites doing the unthinkable - Making a living from poetry. Cindy has Thirteen Marriage Tips for Bibliophiles. Joannie - Pull over and write a poem or What driving while talking on a cell phone has to do with poetry? Following my earlier post on Tuesday I've had additional time to reflect on this subject. In fact I was talking with a peer at a meeting on Wednesday night about this. This person, who is not a blogger, but reads my blog in her e-mail by way of a feed she subscribes to, acknowledged she agrees about the exposure to others people's work. It dawned on me during this conversation that there are many poets who develop close peer relationships for example, with people who go through an MFA program together, and find themselves connected to one another and their work for years after completing the program. For these people, the Internet becomes an extension of the peer contact from the MFA program itself. In spite of distance, it remains relatively easy to follow the work of others through this medium. Their network may start there and expand well beyond. I've not had the benefit of the MFA experience. Certainly none of it, but for the sake of this conversation, the peer network that can develop as a result of it. I have a limited number of individuals, with varying degrees of writing experience, with whom I have face-to-face contact with locally. Clearly these people are important. Still, if left to these contacts alone, there is much I would miss in terms of my exposure to the poetry of today. There are far more people with whom I've had contact than listed in the previous post. But six of those seven people have published work which I have copies of. The other one has a book (nudging myself) I still need need to acquire. Now in each of these cases it is not likely I would have just walked into store and bought their book. Not without other contact. Not without coming to know something about their work, their style, their voice. Through blogging, I've met other poets from beyond the local community. I've learned more about some through interviews. Expanded my knowledge of contemporary and experimental work. Benefited from a variety of poetic voices. Increased my knowledge of available poetry markets, received exposure and yes, feedback on some of my own work. And last but not least, shared in triumphs and rejections. Writing, especially when it comes to poetry is very solitary. It often relies upon withdrawing deep into one's own self which can seem lonely and even dark at times. It's ameliorating when you are exposed to and can learn from other poets who know well that place and the process. I've been exploring this morning the impact blogging has had on my life as a poet. Which has brought me to a realization that it is difficult to imagine it otherwise. For the sake of this post, I want to acknowledge that my reference to blogging includes not only my own, but the blogs of others that I read. I could certainly write poetry without blogs. I have in the past. Certainly people were writing poetry before the advent of blogs. It seems to me that there are several areas that I could touch upon where blogs have had an impact on poetry for me personally. There is exposure to other poets. This is a critical point for two reasons. There are other poets I may well never have made contact with were it not for blogging. Among contemporary poets, there are many extraordinary individuals writing today that I would likely not have been exposed to simply through libraries, local readings, or bookstores. This is not simply a matter of personal enjoyment of the works of others, but in some instances it includes email communication with others writing that have allowed me to network in a much broader circle then otherwise possible. And beyond enjoying the reading of poems by some of these individuals, I firmly believe that those who write MUST read. Poetry bloggers provide fresh material on an almost daily basis. It is no substitute for reading the works of well established poets who are published, but by the same token, if I were limited to the pool of such poetry, I'd be missing a lot of very good material and in many cases newer subject matter or experimental work that I'd never find in a bookstore. Through my own blogging, I've had people come my way just as I have been exposed to others. It is definitely a two way street with respect to networking. People have given me feedback that has been helpful. There was a time when I was participating in two poetry groups and two additional writing groups. That was very time consuming. I've cut back in that area and have done so without sacrificing my exposure to others or their exposure to me by way of the Internet and my blogging. Those are just a few that quickly come to my mind. I don't know that any one of those I would likely have come into contact with if it weren't for blogging. Perhaps Tobios, but probably not. Still, exposure to each of these individuals and their work has been invaluable to me and the progression of my poetry writing. Clearly if someone would ask, I'd have to say the blogging experience has been worthwhile. Yesterday was our 34th wedding anniversary and among other things my wife and I did book store outing. Hey, it's like having your cake and eating it too! We always enjoy book stores. While it may not be reality based, Cathy and I are of the philosophy that books are a commodity that everyone should have available to them and that you should just have a no-limit card that can be used for books only. What a deal! This morning I had a time set aside for a recording of four of my own poems. One or more of them will be part of a CD that is being made of some local poets. Then they will be available in September at two different events in the area. One at a library sponsored event and the other at The Writer's Place here in Kansas City. I felt like the recordings went well. I'll post more about the events soon. The San Francisco Giants were in town for a four game series this weekend. We went to Friday nights game, a 9-4 win by the Giants. It was a great evening at the ballpark! Of course I'm an avid Giants fan so this was like heaven. Plus there was an awesome fireworks display afterwords. I shot some game pictures - when I gent then downloaded I'll post a couple. The poets lineup for the 2008 Geraldine R. Dodge Poetry Festival is a full and varied sampling of poetic voices. CD Wright, Brenda Hillman, Coral Bracho, Robert Hass, Martín Espada,Franz Wright, Linda Pastan, Maxine Kumin, Naomi Shihab Nye, Jane Hirshfield, Taha Muhammad Ali, Ted Kooser, Mark Doty, Edward Hirsch, Chris Abani, Charles Simic, Joy Harjo, Lucille Clifton, Sharon Olds, and last but not least Billy Collins. As many as 20,000 are expected in the historic Waterloo Village in Stanhope, New Jersey for the 12th biennial event which will run from Thursday, September 25 through Sunday, September 28, 2008. Small wonder the Bush administration has insisted on immunity from prosecution for AT&T and other telecommunications that granted government access to private phone conversations and e-mails without due process or order from any court. 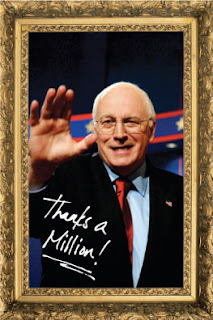 The political action committee at AT&T contributed the maximum amount allowable by law to the Bush/Cheney campaign — twice. US judge blocks CIA flight case - "The very subject matter of this case is a state secret," Judge James Ware wrote in a ruling. Laird goes on... "You can make fiction and drama from reported stories, from hearsay and incident, but not poetry." It is my own experience that words rather than a particular story do indeed tend to go much further towards the success of a poem. It's not that I have not tried the other approach, and likely will again (I tend to be stubborn like that), but it is the cohesive junction of a word and an image, or a word and a smell or some other word and sense linkage that is more likely to drive a poem forward than anything else I've found. Lair also quotes Edward Thomas , the early 20th century English poet on the subject of what poetry is made of, "Anything, however small, may make a poem; nothing however great is certain to." The times I have sit down with pen and paper to specifically forge a poem on some grand storyline have almost always met with failure or disappointment on my own part. Sometimes, I have found it helpful to lift a very short line from another poem or sentence of some other type of work and use it to start a new poem. I try to let those few words allow some image to direct me forward with what I am putting on the page. Later, the opening line can be dropped, just as any of the the rest of the work can be modified and rewritten any number of times. I find it's just a really good way to jump start a poem into being. So I tell myself here that I need to resolve that I am going to stop trying to force something into being. I must periodically remind myself of this. I do it here, once again. Sigh. Tim Russert came on the scene as a television journalist back when I was still very involved in Democratic Party politics on a daily basis. Russert became a Sunday staple that I turned to for insightful coverage of the political landscape and governmental issues as well. For those entrenched in politics, he was an essential. Indeed it can be said that he grew in such prominence that one could argue that to get to the White House, you have to go through Russert. You had to be baptized into the litany of Meet The Press guests that Russert grilled. When my wife called me at the office yesterday and told me of Russert's death I could hardly believe it. Both my wife and I each morning tune into Morning Joe on MSNBC as we are getting ready for work each morning. One of the highlights is always the visit by Russert and his most recent take on the presidential campaign. I said to Cathy upon hearing the news, "Oh my God, he won't be here for the election." Indeed, it already feel like election night will be hollow. I realized as I have thought about his sudden departure that there are aspects of Tim Russert that I will miss that transend his political analysis. For one thing, no matter how serious Russert was on the air, their was a genuine upbeat and personable quality about him that you so seldom see. His smile and laughter were almost trademarks of every apperance he made. For many who are perhaps not as old as I am, the image today of TV journalism is so very different from what Russert served up on Meet The Press. It was not about glitter, it was not for show. It was not entertainment news in the context that so much of Cable News has become. There was an integrity that he maintained throughout his career that you don't generally associate with TV journalism elsewere. Russert was a tough interviewer, but he was always fair and always dignified in his interaction with guests. There were certainly times when an interviewer would hang himself, but Tim Russert never kicked the chair out from under him. He always was in search of truth wherever it might lead and he was always willing to give his guests the benefit of the doubt and allow them to explain anything they felt was necessary. This Presidential election campaign has already been a historic one. It's an election unlike any we've had before and it just doesn't seem right that Tim Russert will not be calling the states on election night. For yet a third time, the U.S. Supreme Court has rebuked the Bush Administration on it's handling of the detainees at Guantanamo. It struck down a 2006 law the Republican-controlled Congress passed at the request of the President, called the Military Commissions Act. The act suspended habeas corpus - a prisoner's right to challenge his or her detention. In the court's decision, Justice Anthony Kennedy, said, "The laws and Constitution are designed to survive, and remain in force, in extraordinary times." I've found it very difficult to understand how it can be viewed otherwise. It is such a fundamental part of our justice system. I will be anxious to hear what the President has to say about this decision. Mark your calendar for next Tuesday, June 17, 7:00pm for a reading at The Johnson County Central Resource Library / 87th Street and Farley in Overland Park. Poet Maryfrances Wagner celebrates the publication of her new book Light Subtracts Itself. Joining her will be Poet Laureate of Kansas, Denise Low. I just got news that Kim Addonizio has two books coming out in 2009 from Norton Publishing. Ordinary Genius, which is a book on writing, will be out in February, and later in the year, a book of poems, Lucifer At The Starlite. How exciting! Kim is one of my favorites. Looking for interactive writing prompts? There are prompts for all kind of writing and all ages at Writing Fix. Yes, there are poetry prompts too! There is a side of me that I am told is not focused, or perhaps too easily focused on things of lesser significance. This can be hindrance in many ways that I probably don't need to explain. I have also found that it can be harnessed to some degree to let in things that ordinarily might be missed. For example, Saturday morning on our deck I distinctly heard the sound of waves against the rocky shoreline in northern California. Quite a feat for being in Independence, Missouri. The Surprise Maples in our backyard, along with a chorus of other nearby trees were pounding against the shoreline in the June breeze. I was transported to Monterrey Bay without the $4 a gallon price tag for gas. I think I've become more aware of my surroundings the last couple of years. Especially to the not so obvious things. Some of this transformation seems to have come naturally. Well, at least somewhat involuntary. Not through any conscious effort on my part. But as I have realized the power of imagination that has come with this, I have more recently tried to harness it and improve on it. I believe there has been some increased benefit from this effort. I heard something the other day about people losing their creative tendencies as they grow older. The piece may have been on NPR ( I can't recall) but without providing clear answers as to why, it was exploring the prospects that what inhibitions prevent us from our wildest thought explorations as children seem to vanish with age. With so many more experiences to draw upon, this seems to run contrary with what one might expect. Yet it is probably true. So how do we keep our imaginations young? How do we open the mind to greater creative possibilities? virgin issues sautéed/in a time honored tradition of denial. cars pass both ways-/my ride absent and my mind/dismantled in the heat/one thought at a time/ until I'm one/with the sky's urban haze. If I dreamed last night, I'm certain it had Pat Benatar's hit rock song "Hit Me With Your Best Shot" jamming throughout it. Why you ask? Just a hunch. When I woke up this morning the music was going through my head like I was possessed by it. It could be all attributed to my daughter's Guitar Hero game that she brought with her on her visit home. Yes, I've fallen marginally addicted to it. It's not quite the same high I get from playing baseball on the play station, but it incorporates a bit of nostalgia, music and of course a challenge. She has the #3 version, and other songs that catch my fancy are, Rolling Stones hit Paint It Black, "Sunshine of Your Love" by Cream, Alice Cooper's song " School's Out" and "Black Magic Woman" by Santana. It's not like I ever had a desire to be a rock star so this whole thing is a bit weird but if my eyes look glassed over and I don't reply when you talk to be, it might be the bottom of the 9th, two men on and we're behind a run and I'm at bat, or it could just be "Hit Me With Your Best Shot" strumming through my head. The connection between music and poetry is the topic of a blog post yesterday by Kelli Russell Agodon. It's worth taking a moment to read her explanation as I believe it offers great insight into the sound our writing makes and what it can do to the poem. Check it out here. Last night we picked up my youngest daughter at the airport and met my my son for a quick bite to eat on the way back in to town. The Kansas City metro area was under a severe weather watch and there was terrific lightening, off and on rain, monstrous clouds and a rainbow gracing the sky. Things then turned more ominous looking as we were leaving, the sky had a vast airstream of deep black velvet smoke drifting in from a westerly location. 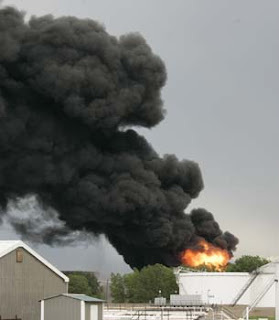 Across the state line into Kansas City, Kansas (sister city) a gas storage tank in an industrial area had been struck by lightening. The resulting smoke and the mixture of other sky components previously mentioned, presented a surreal atmosphere. As we drove on home to Independence, the electrical storm became much more intense. This morning, on the drive back into KC, the black stream of smoke continued to funnel skyward in what otherwise were clearer, bright morning skies. The fuel tank was no doubt still actively ablaze. It brought back to mind pictures of the skies over Baghdad in the early days of the invasion. On an obviously smaller scale of course. Was it Bukowski who said/upright is so overrated?/If he didn't, he should have. The doors finish is marred/with the anxious requests/of a dog who wants me to know/he wants out. Testing the wind/for aptitude,/I find myself defending/its meager showing. Someone will give us props, if not from ourselves they/will come, not as gentle rain/but as the rat-a-tat-tat/of an automatic that/ speaks and then leaves behind questions.